Over 40 years of experience, we were the first registered food producer in Granada and only the forth in Andalucía. Jamones Quesada Carpio has a thorough quality control procedure carried out by our experts. The Quesada Carpio family run business is dedicated and passionate about ham, this is evident in the quality and level of service provided. We are situated at 900m above sea level where the air is pure and dry with extreme temperature variations between day/night and summer through to winter. Marry this with the aromatic air coming from the surrounding nature reserve of the Sierra de Baza and you have the ideal microclimatic conditions to cure ham. One of the most renowned food from the Mediterranean gastronomy, “Serrano” and “cure ham” due to its good taste and healthy properties. This ham comes from the Landrace and Large White breed. These races are originally from Denmark and England (Yorkshire county) respectively. This ham has a very balanced taste and proportions of meat and fat. The hams have important nutritional properties due to their protein content, B vitamins and minerals like zinc, iron, phosphorus and magnesium. All of these are very important for childhood growth, sports people and the elderly. Gran Reserva: more than 18 months. Reserva: between 14 to 17 months. Bodega: between 12 to 13 months. THE BERKSHIRE HAM is a breed from Berkshire County in United Kingdom. This product is an exclusive category of products owned by JAMONES QUESADA CARPIOS.L.. We select the best English breeds to cure in Spain with the most rigorous and traditional methods. The meat has a softer and finer texture. The colour and flavour is natural and very appreciated by the most demanding consumer. The average age of this ham is 22 months. DUROC JERSEY is a breed of U.S.A. origin. This product is the result of a crossing of male Duroc Jersey and a female Duroc Jersey x Landrace-Large White breed. This cross-breeding produces a juicy ham with a high degree of infiltration and a proper and unique bouquet due to good feed comprising of the best cereals. The minimum time of maturating is 18 months. IBERIAN HAM is sourced from the genuine Spanish pig breed. These products can be classified as Iberian if they are a minimum of 50% Iberian breed according to the law (R.D. 04/2014), for example the results of crossing a 100% Duroc Jersey male pig and 100% Iberian pig female. The best Iberian hams are 100% pure Iberian in breed which have been fed by acorn. The main characteristics of Iberian hams are the intensive colour, special flavour, and brilliant line of healthy fat between the meat. It produces a ham worthy of the finest palates. The curing time is more than 24 months. CHATO MURCIANO is a pure breed from the Murcia Región (Spain) with a very limited production. Normally this kind of ham has a high fat content with a fully aged flavour. These hams are usually larger and therefore heavier than other hams. The optimum curing time for this ham is more than 36 months. A Ham whose breed comes from Hungary, THE MANGALICA breed. It is a result of crossing the Mangalica, Duroc and Landrace x Large White breeds of pig. We buy the raw hams from an abattoir in Hungary and we cure them at Jamones Quesada Carpio (Spain) using artisanal methods. The flavour is strong and intensive and the meat colour is darker. The curing time is also more than 18 months. This kind of ham is a cross between 100% Duroc Jersey male and 100% Landrace x Large White female. Furthermore, the pigs have been fed 200 grams of chestnuts in the latter 3 months of their lives in Galicia (Spain). The chestnuts make this ham healthier due to the higher level of unsaturated essential fatty acids (oleic and linoleic acids) and the semi-extensive way of raising the pigs. The ham is tender, juicy and has slight sweet subtleties to its flavour. The maturating period is more than 18 months. 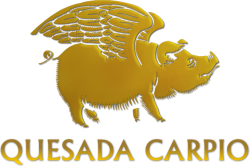 JAMONES QUESADA CARPIO is a family run business dedicated to the production of cured ham since 1976. We were the first food producer in Granada to obtain a Health Licence for Food (NRS ES10.00108/GR) and also the oldest registered ham producer in Andalucía. We specialise in curing ham and have perfected the artisan process to make our products the most suitable choice for professionals: delicatessens and gourmet restaurants. Our location is an important factor in achieving the exclusive flavour and quality that our products possess. With its dry climate and extreme temperature variations, both day and night and throughout the seasons, we are perfectly situated. The microclimate of our drying rooms are carefully monitored and controlled. When required we open the windows allowing clean air from the nature reserve of the Sierra Nevada (Granada) to flow in giving our hams a special flavour from the aromatic plants and trees in the surrounding countryside. Our expert team select the best raw materials. We classify our hams according to the different pig breeds, each with their own organoleptic properties. Our variety of hams are unique in the market place due to the breeds we select. We work closely with the farmer to improve the quality of the meat by introducing new kinds of feed. For example, our hams from pigs fed by chestnuts and beer yeast are our newest and healthiest range of hams. The process of curing ham, which has been perfected over the years, is a slow, natural and unforced process with a low level of salt. We use traditional handcrafted methods to cure ham such as protecting and hydrating the ham with lard as well as blood removal from the raw ham. Working closely with our farmer we are proud to present our new 'healthy range' of ham. Gran Reserva Gold is the brand new name for this range whereby we have introduced new feeds to the pigs such as the chestnut and beer yeast. Come and visit us at the Speciality & Fine Food Fair Olympia London, 2–4 September 2018. We hope you like our new look website. You can now browse our full catalogue of ham, cheese and olive oil, as well as our new range of healthy ham - Gran Reserva Gold. Ctra. A-334 Baza-Caniles, km 8,3. Data submitted by this form will be used by Jamones Quesada Carpio S.L. and no one else. We ask for your telephone number to help us expedite your enquiry.